The Romance Dish: There Must Be Heyer Love! Do any 80s tragics like moi get the title pun? Anyway, back to the Regency! What is that glorious purr in the universe? Can it be the Ginormous Cat who curls up in the padded armchair at the heart of all happiness? No, it's not. Although I have to say the megalomaniac who lurks beneath my modest exterior got a kick out of inventing a new mythology! 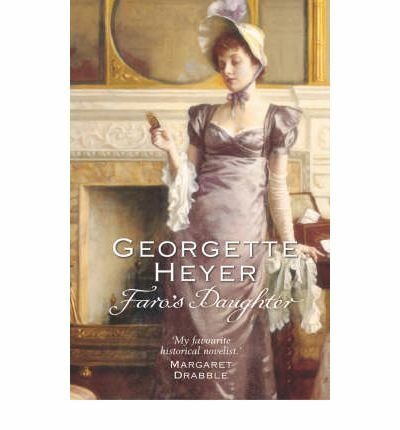 It's me doing another Georgette Heyer fest for this month's review. We always have wonderful discussions here when it comes to one of the goddess's books - and today I thought I'd talk about two of her works. So on mathematical principles, we should have a discussion that's twice as good! FARO'S DAUGHTER is a bit like one of those French farces with everybody popping out of doors and out from under beds all over the place. It's VERY funny and definitely a comedy of errors. Max Ravenscar is one of the richest men in England and a noted sportsman with no desire to marry. This ruthless plutocrat is drawn into a scheme to separate his young cousin, Lord Mablethorpe, from the unsuitable woman he wants to marry, Deb Grantham who works at an upper-crust gaming house. Unfortunately for Max, Deb is just the kind of woman to attract his interest and not at all the kind of woman to let him get away with his usual commanding ways. Spiraling chaos ensues, including a kidnapping, young lovers, elopements, a runaway heiress, several dotty female relatives (G.H. does wonderful dotty female relatives! ), plot and counterplot, a carriage race, misunderstandings galore. And all of this in a mere 260 pages! I'm in awe of the goddess's tight grip on events and character so that she can tell a satisfying story with a lovely romance (well, lovely in the sense of combatants tumbling into adoration!) within this space. Definitely worth reading if you're in the mood for madcap sparkle and Regency highjinks. SYLVESTER: OR THE WICKED UNCLE is another fun read. Sylvester, Duke of Salford, is convinced he's a really good guy; nobody in his world has the guts to point out to him that he's actually insufferably condescending. When he decides to get married, he puts together a list of five incomparables, none of whom QUITE match his high stickler requirements, with one addition, Phoebe Marlow, the daughter of his mother's best friend. Sylvester is marrying partly to please his mother so he sets out to Lord Marlow's house to inspect this chit and see if she makes the grade. Phoebe has had one unsuccessful season when she danced with Sylvester, not that he deigned to remember this when he saw her the next night at Almack's. Phoebe, whose home life with a bullying stepmother is unhappy, has plans of making a living as a writer and has just had her first manuscript accepted. Unfortunately, the villain of this piece is based on Sylvester who has very distinctive eyebrows. Even more unfortunately, the villain of this piece has a nephew he's tormenting. Unbeknownst to Phoebe, Sylvester is guardian to his own nephew over whom he's conducting a custody battle with his mutton-headed and flighty mother. Society is quick to make the link when Phoebe's book comes out and imagine Sylvester guilty of all the sins of Count Ugolino in the novel. When Phoebe runs away from home to avoid marriage with a man she considers overbearing and selfish, Sylvester starts to get an inkling that he's not as universally adored as he thought. As his relationship with Phoebe develops, his amour-propre receives so many hits, you almost feel sorry for him in the end. Well, in between laughing at his dire straits. One of my favorite bits is when he's forced to cope alone with a sick and cranky child he's rescued from France. By the end, Sylvester is a better man and Phoebe is a stronger woman who has come into her own. You just know these two are going to be great together as the Duke and Duchess. Big sigh of happiness from this reader. So have you read these two? Any preference? Both FARO'S DAUGHTER and SYLVESTER feature heroes who have learned the error of their ways by the end. Love that trope! Any favorite arrogant heroes in romance fiction who get their comeuppance? Let's talk bringing down the uppity hero today! I hate to admit that I have yet to read on of Heyer's books. Everything I have read about them indicates the are must reads for those who enjoy Regencies. I have a couple in my TBR mountain and should probably dig them out. Off hand I can't think of any uppity heroes. I think they and their comeuppance need a light- hearted story to really work best. Most of the heroes I can think of at the moment are a bit arrogant before being brought down by the heroine, but that isn't quite the same thing. Thanks for the reviews of these books. Either one of the two above sound like a good place to start on her works. Pat, I think either of those would be an excellent starting point if you're interested in exploring Heyer. Probably Sylvester is a little more typical of her work than Faro's Daughter, although FD is great fun, as you've probably gathered. I think heroes with a touch of arrogance are one of the staples of romance, aren't they? Love seeing them all at sea when they fall in love! Yes, I did get the title pun - and groaned. How do the Dishes let you get away with that? Sigh. Loved your review, thanks. It's been so long since I've read either of these books. I think Faro's Daughter must have been one of the earliest GHS's I read and I loved the way Deb is sooo wrong for Max and therefore obviously perfect. I remember the fun and frolic of the story. Interestingly, though I enjoyed Sylvester I think I've only reread it once or twice. Maybe I'll have to pick it up again and see why. Really, she's such a clever author in her portrayal of him - so intelligent and so clueless about himself. Annie, I about snorted my tea all over the computer keyboard when I saw the title. That'll teach me to read anything our darling Anna writes when I have a mouth full of liquid! lol! The Dishes are very kind to sad little tragics like moi, Annie. They'll get their reward in heaven. Actually I'm catching up pretty well on re-reading the Heyers. They're so charming! Thanks for swinging by. Anna, the Dishes are delightful. Not even a tiny groan uttered over that pun? Glad to hear you're enjoying the Heyers. I'm looking forward to my next bout of GH reading. Hi Anna! It's been ages since I've read Sylvester, but I'm a huge fan of Faro's Daughter. I love the scene at Vauxhall when Deb pimps herself out in order to shock everyone, and her kidnapping escapades with Max are priceless. I think FD is one of Heyer's funniest and most satisfying romances, but it's often overlooked. I'm so glad you reviewed it! Vanessa, as I said in the review, I'm all admiration for how she manages to tell this story in such a short space. And it's definitely one of the funnier Heyers. I love that scene where Max takes her for a drive and tries to buy her off too. Lovely stuff! And as you say, that scene at Vauxhall is priceless. I have not read either book. 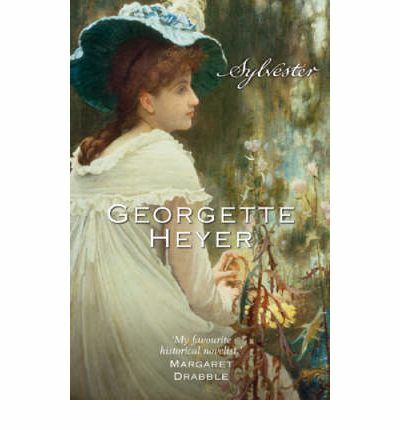 I do enjoy reading Georgette Heyer. Mary, if you enjoy Heyer, I think you'll love both of these. They're definitely among her most entertaining. I have not had the chance to read either of these books but I have read many other Georgette Heyer's books and they have never disappointed me. Reading one is like nibbling candy and it's hard to stop once you get started. When you mentioned humor in "Faro's Daughter," that really grabbed me. A romance novel is not complete without a bit of laughter. Thank you so much for these synopses. I look forward to reading them. Connie, if you like Heyer, I think you'll love these. I've noticed they're two that come up when people talk about their faves in her work. Both are on the lighter side of her productions and I bet you close them with a big smile on your face. PJ, Sylvester is great. It's so wonderful watching him stumble, very unwillingly, into self-awareness and he falls in love so hard with Phoebe, who is the last person he can imagine himself loving, that you just melt. Sigh. That does it. Off to order! I make it a point to reread a few Heyer books every year. I never tire of them. Frederica, The Grand Sophy, and Venetia are my favorites, but Sylvester also ranks highly with me. I do appreciate the humor, and I also think it has a wonderful mother/son relationship, something not too common in romance fiction. I like Faro's Daughter too. I reread it last year when I was working on some Heyer articles for Heroes and Heartbreakers and delighted in the arrogant Ravenscar all over again. Heyer created the prototypes for so many character types now beloved in Georgian and Regency-set romances. Janga, in my Heyer re-reading question, I've read all three of those. I can never quite forgive TGS for the Jewish scene which is a pity as I loved everything else about it. And I adore that last line from Charles. Frederica is lovely and Venetia would still be one of my favorites. I think Damerel is SUCH a gorgeous hero. It's interesting how so many of the themes and archetypes of Regency romance are there in her books, isn't it? I started reading her in primary school and I think those themes must have lodged in my brain so when I came to writing Regency romance, it felt very familiar and comfortable to me. I've got to be careful, though - her voice is so strong, if I write after reading a Heyer, I start to sound like a poor imitation! Oh, interesting about the pronunciation. There goes my pun! Didn't Steve Winwood sing that song? LOL! I have to admit that I have never read a HEYER book. Guess I need to remedy that, huh? Buffie, Buffie, Buffie! You say that every time I do a Heyer review! Next time I see you, I'll GIVE you a Heyer book! LOL! And yeah, it's SW! Love that song. Gannon, you know I never lead you astray! Well, not when it comes to books anyway! Glad you laughed at the pun. That Annie West implied it was completely groan-worthy! LOL! Anna, I totally get your title pun!!! One of these days, I simply MUST read a Georgette Heyer book. So many people cut their romance teeth with her books and I need to see what the fuss is about. GREAT blog!! Thanks so much, Andrea. I love the way doing this column lets me revisit old favorites. I'm doing some Mary Stewart romantic mysteries next month - definitely old school too. Thanks so much for having me as your guest every month. It's always great fun! Oh, I really remember Sylvester much better than Faro's Daughter... they were both such great fun.. but I do like Sylvester just a tad bit better... GH got me started on Romance!! GGH, I think that speaks for a lot of us. My mother gave me my first GH when I was in primary school. Loved them. FD is more a slapstick comedy than Sylvester - they're both great fun. Thanks to everyone who swung by and thanks, as ever, to the Dishes for hosting me. Come and see me next month - I'm still dabbling about in the old school and talking about a couple of Mary Stewart romantic suspense novels! I've been away so hope I'm not too late to comment. I loved both and think it's time for a reread. Venetia is one of my favorites as is The Grand Sophy and I do have a big problem with the Jewish scene. The Toll Gate is another of my favorites. Anna keep those wonderful columns coming. Connie, it's interesting about that Jewish scene - to me, it really was a huge blot on what was otherwise a wonderful book. And you know, it really didn't need to be! It doesn't feed into the main plot and sorting out that particular subplot could have been done in a much more subtle way. Oh, well, even goddesses falter occasionally! I must re-read the Toll Gate. I'm gradually getting through them all. And no, of course you're not too late! I got it Anna! Sorry, I have read several of Heyer's Regencies, but not these two. I loved "Venetia" and "A Convientient Marriage." When I read "Venitia" I had the sense that I had read the book before. I had not, but then I realized why it seemed so familiar: Stephanie Laurens' had used a very similar introductory scene in one of her early "classic" historicals! Interesting, Flora. I think a lot of those classic GH themes have been re-used over and over by later authors. Imitation is the greatest form of flattery! Yeah, Venetia is pretty hard to top!